Thank you to everyone who took the time to comment and share the upcoming May & June shows that they are looking forward to shopping and participating in! It was fun to hear where everyone is going to be and even learn about a few new shows to post on the site. DFWCS is all about sharing show information in order to help vendors, shoppers, and even local events become more successful. If you hear about a show that you don't recall seeing on DFWCS, please email us the info so we can post it on the site! A huge thank you goes out to all the lovely people who have already been emailing me events and helping me stay current on our listings. Without further ado, the winner of the giveaway is... Cairenn! You have won this beautiful bracelet donated by Abbie of Eye On The Sparrow Designs. 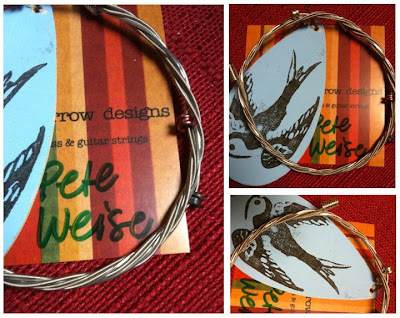 Abbie creates all her jewelry from used guitar strings, and they are amazing! The strings for this bracelet were donated by Pete Weise of Denton. Congrats Cairenn! Please email us at dfwcraftshows@gmail.com to collect your prize. Great! I'll email you now. Abbie is going to be coming out to Shakespeare Dallas for a few nights in July! She makes GORGEOUS stuff!